OXO is a brand you may have seen in your local kitchen supply store over the past decade or two. Known for durable plastic and metal kitchen utensils, they have recently delved into the realm of electronic gadgetry with their new line called “OXO On“. In this line there are initially three products for coffee, and we got our hands on them to take a closer look and show you the features. This review will look at the ‘Barista Brain 9-Cup Coffee Brewer‘, identify the features, and list the pros and potential cons to consider. Single Serve Capability – This brewer is designed to be able to brew as little as 2 – 5oz “cups” (basically just enough for a small cup of coffee), which can be convenient if you don’t need or want to brew a lot. Very useful for more expensive coffees which could be considered more of an indulgent treat than a morning fuel. Precise Temperature Control – The water is heated between 197-205°F, which is within the recommended range as prescribed by the Specialty Coffee Association of America (SCAA). This temperature integrity is important for extracting all of the desired elements of the coffee, specifically body, sweetness, and acidity, without bringing out the more bitter flavors. Intelligent Microprocessor – Referred to as the Barista Brain in the brewer’s literature, the programming is designed to pulse the hot water slowly over the coffee grinds. This technique is meant to emulate the methods employed by baristas in cafes, which includes a “bloom” and a steady amount of water on the coffee as it brews. Intuitive LED Interface and Dial – OXO has made the 9-Cup brewer easy to use, from selecting the proper brew to programming the auto-start time. The dial turns smoothly and features a single push button in the center for activation. Again the brewer takes care of the details of brewing, and starts a count up timer (that goes to 1 hour) after brewing so you know how long the coffee has been sitting there. Removable ‘Rainmaker’ Shower head – Designed to allow the hot water to drip evenly onto the coffee grinds, the shower head is simple in design and easy to remove for cleaning. A well designed water pour is vital to making the best brews of coffee. Cone-Shaped Brew Basket – The “truncated cone” shape has been established as a great way to brew coffee over then years. OXO has implemented this standard “#4” sized basket for the 9-Cup brewer, and the filters are easy to find in most places that sell coffee. The basket, which the filter is placed inside of, is fully removable for cleaning. Removable Silicone Internal Mixing Tube – When drip coffee brews, different elements are extracted from the grinds at different times as more water is poured through. OXO has utilized a tube which allows the freshly brewed coffee to go to the bottom of the carafe (shown below). This forces the brew to mix better than simply dropping it into the top of the carafe. Vacuum-Insulated Carafe with Brew-Through Lid – While a thermal carafe is not a new concept, it is simply one of the best ways to keep fresh coffee hot. External burners essentially reduce and burn coffee over time, so simply preventing the heat escaping with a well designed carafe is typically the best solution. In this case, the carafe is sealed and the coffee is allowed to brew through the top to try and prevent losing any extra heat. With all of these features, it is easy to assume that this brewer is going to make an amazing product. While we feel that the OXO On 9-Cup brewer is a worthwhile product, we also wanted to give you our in-depth findings in a pros and cons format. Some of these are not directly related to the finished brew but may be a product of convenience, usability, or overall functionality. Grind Saturation – The grinds are very evenly saturated, indicating a quality brew. No problem has been observed in creating the ideal water dripping pattern. Consistent Brewing – Brew results have been very consistent when tasting. This is a reflection of the saturation, and means that this 9-Cup brewer is capable of making your favorite cup time after time. Quiet – This brewer is QUIET! Almost disturbingly so. All you hear is a soothingly soft gurgle at the end of brewing. You might end up brewing a pot just to listen to its peaceful brewing. Programmable Auto-Start – Like many contemporary brewers, the 9-Cup has settings to start your brew at a specific time, ensuring you have a fresh pot first thing in the morning. Double bonus: After brewing finishes a 1 hour count-up timer begins to show you how long it has been since your pot brewed. Thermal Carafe – Thermal carafes have become rather standard, and this is one of the best we have seen. Easy to open and close, pourable without adjustments or levers, great heat retention, clean and easy pouring. We love it! 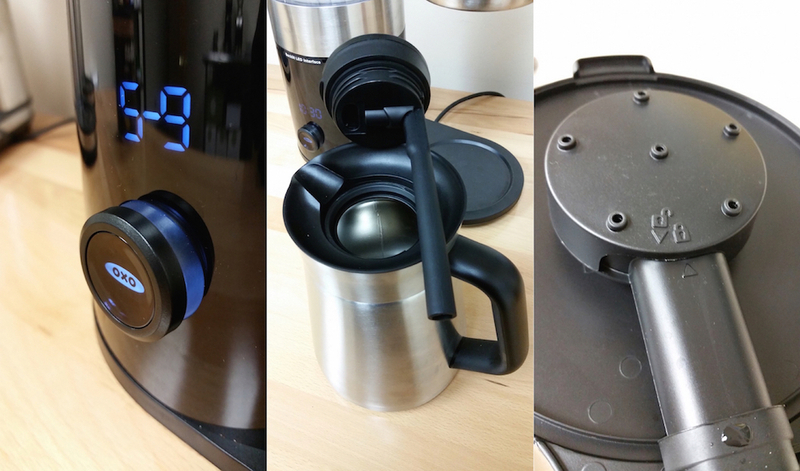 Ease of Use – This brewer has one button/knob for all functions. While programming the auto start is a little tricky at first, the other functions are extremely simple. Fill the water, put in your filter and grinds, select how many cups you are brewing, and push the button. The “Barista Brain” takes care of the rest. Pulse Brewing – The for-mentioned Barista Brain takes care of the details of brewing for you. It implements a pre-wet at the beginning and gradual pulsing of water throughout the process. Solid Construction – Who says that plastic has to be cheap? OXO has built this brewer with high quality, sturdy parts. It feels substantial, sleek, and well designed. Will it hold up over time? It is hard to tell immediately, but we feel the answer is yes. Tall Design – This is a tall brewer. It measures 15 inches (38cm) normally, which likely makes it a poor fit under kitchen cabinets. Add in that you must be able to fully open the top doors to fill water and access the coffee filter basket, which increases the needed clearance to 22 inches (56cm), and you may realize that accounting for proper counter space is a must with this brewer. Long Brew Time – We started by brewing a standard 1 liter (@6.5 cup) batch of coffee, which took 6.5 minutes to brew. This may not seem like a big deal, but it is a full 2 minutes longer than other comparable brewers. If you are not using the auto-start timer, that extra time could feel like an eternity waiting for your first cup of the day. Another big concern is the potential over-extraction of grinds due to the long contact time. Lack of Brew Time/Pulse Adjustment – This is a bit of nitpicking, but the ability to adjust the overall brew time or pulsing of water was something we found ourselves wanting. Not having this feature makes for simpler product use, but sacrifices some functionality for more advanced users. No Metric Measures – Another con that is less than dire. Since this is an American made brewer, it makes sense to use the standard “cups” (which is 5 fl oz per cup in this case). Non standardized cup measures have been an endless point of confusion in coffee brewing, and having a metric counterpoint is sometimes helpful. It would also make product use easier for folks who grew up outside of the US. 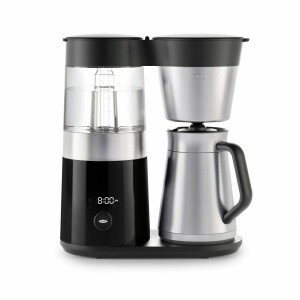 The OXO On – Barista Brain 9-Cup Coffee Maker is a formidable entry into the auto-brewer market. With tons of features and a reasonable price point ($199), this coffee brewer is set to blow away the competition. In our taste tests, the 9-Cup brewer was superior or equivalent to most other brewers we tested. Overall, if you are interested a fully functional coffee brewer and have the appropriate counter space, this is a smart buy. We will do a full side-by-side of all of the SCAA certified coffee brewers in a future article to compare and contrast your options. I just purchased your OXO 9-cup coffeemaker. It makes very good coffee, but I am wondering why after the first cup (I made 4 cups), the coffee really isn’t hot — more luke warm. Is this a problem? There are a couple of things that could be causing this. First, the more air is in the coffee pot the faster it will cool down. Since you are brewing 4 cups more than half of the space is air to start with, and once you take out that first cup the remainder will cool even faster since it is now around 3/4 air in the pot. These coffee pots work at their absolute best when you brew a full pot, but obviously if you don’t need that much this can be an issue. -“pre-heat” the pot with very hot water, or simply run a batch of water through the brewer first. The metal interior will absorb some heat, which makes your coffee cooler especially when making a small batch. -Pre-heat your ceramic mug or drinking vessel. This is another place where heat is lost very easily. If you run water through the pot first to heat it, use that same hot water to sit in your cup(s) until you are ready to pour. -Brew a bigger pot. This is not ideal I am sure, but it will work. Second, it is possible that you have a defective coffee pot. To check the thermal integrity simply brew a pot of coffee (or water) through the machine and feel the exterior of the pot. If you feel heat (noticeably hot to the touch) on the outside of the coffee pot then you likely have a defective pot. I would recommend making sure your warranty is registered with OXO, and then contacting them at http://www.oxo.com for more details. Unfortunately it has been established that having the old style heater under the coffee pot is very bad for coffee’s flavor and so those are becoming less common, especially with newer and better quality coffee brewers (you can find them still, but we do not recommend them simply because of the impact on flavor). 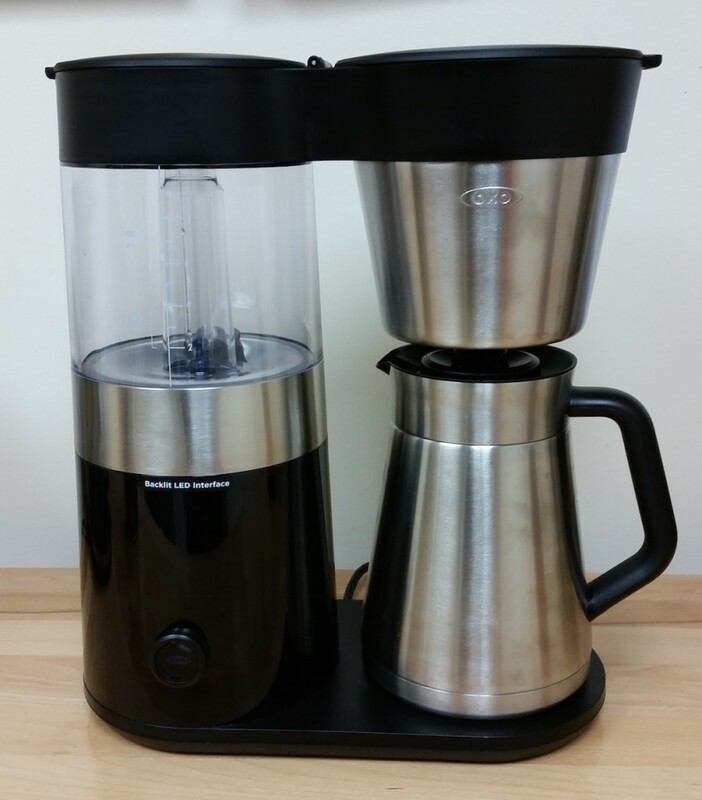 The vacuum sealed stainless steel coffee pots should keep your coffee quite hot, even with smaller amounts of coffee, so make sure to test the thermal integrity of the pot and make sure it is not defective! I hope this helps you get the cup of coffee you are looking for, and thank you for the question. Keeping coffee piping hot is a concern for many home coffee drinkers. Thanks for the great and thorough review. I’ve been looking at a higher end coffee maker for the past month or so and I keep coming back to the Oxo 9 cup. My only concern is over reliability. I don’t want to spend $200 for a coffee maker that won’t last for more than a few years. I currently have a Cuisinart with a grinder built in that I’m ready to get rid of but I’ve had it for close to 10 years now. Has Oxo made coffee makers for a while or is this the very first attempt? I would also imagine that with the SCAA certification, they probably made a pretty reliable device. Any thoughts from you? Hello Jeremy! The OXO brewer is actually the first incarnation for the brand. Actually, up until the Barista Brain line they had not yet designed anything with electrical components. So, in terms of reliability, we would say that it’s built well from hearty materials, but hasn’t had enough time on the market to know for certain how they will go. For a few other options worth looking over, check out how we decided on the Bonavita 1900TS. All of the brewers that we considered are SCAA certified, and we get into the nitty gritty details of how they all compare. Thanks for the questions! I just bought the 9 cup BB and when I washed the carafe (prior to using) and dried it, water kept seeping from the seam between the top handle band and the body of the carafe. Is that normal or do I have a defective item? I have not had this happen with our unit. Ours seems very well sealed and sturdy, so this may very well be a defective carafe. You should contact OXO at their customer service department at 800-545-4411 to see if you can get a replacement. How do higher altitudes affect the resulting quality of the brewing process. (I live at 5000 ft elevation.) Any tips on how one could make adjustments to improve brewing quality of this machine at higher altitudes? As far as elevation goes, 5,000+ feet can definitely make a difference in the outcome of a brew. Along Pete’s competitive journey, it definitely was a factor we had to learn more about. In 2011 he had produced, roasted and practiced with his own coffee in Hawaii (effectively sea level) but the World Barista Championship that year was held in Bogota, Colombia (over 8,000 feet). The biggest factor we noticed was to do with the age of the coffee- at a high altitude fresher was not better- in fact, from discussions with our coffee friends in Denver we’ve gathered that they often wait around 15-20 days off roast before brewing. Thanks for the questions and happy brewing! Does the 9-cup coffee maker have plastic parts that come in contact with the coffee? Thanks. -Hot water shower head – The even saturation of coffee grinds is very important to a quality brewer, and this is a tough one to find without plastic. The piece on the OXO 9-Cup brewer is easy to disassemble and clean though at least. -Plastic dripper cone – The dripper cone is where the hot coffee slurry will have the highest contact time. If you are concerned with plastic touching the coffee, this would be the one place to fix. The exterior of the dripper cone seems to be lightly insulated with a brushed steel material, which may help retain heat that gets lost from the plastic cone. There is a push valve at the bottom of the dripper to stop dripping if the carafe is removed, and the design will not allow for any standard brewing cones to replace it. There is also a plastic coating between the steel exterior and the plastic cone. -Plastic flow through carafe lid, with silicone mixing tube – This one is less concerning, as the liquid flows through quickly and has minimal contact time. However, flow through lids are notoriously difficult to clean and can get pretty gross easily. I’m not a huge fan of silicone, but the mixing tube seems to be relatively taste and odor free. You could replace the carafe with a different collection device, but don’t forget that the dripper cone has a push valve to allow the coffee to flow, so make sure your replacement can do the same. Hope that helps Richard, and thanks for the question! I just bought the 9-cup Barista Brain for my wife as a Christmas present. Unfortunately, the coffee tastes quite bitter, to the point where it’s not pleasant to drink. Curious if the temperature was too high, I stuck a digital meat thermometer into the water stream as it exited the (empty) filter/basket into the carafe, and it was around 185 degrees F. That seems to be about right if you assume the water temp drops 10-15 degrees as it passes from the shower head, through the empty filter, and through the basket. It’s much harder to get the thermometer probe into the water stream of our old coffee maker, but the old one measure around 180 degrees. As I could only get the tip of probe into the stream, I can’t be sure the old coffee maker is really 5 degrees colder. The old coffee maker was considerably faster though, and I noted with interest your reference to over-extraction due to long brew times with the OXO. Did you actually find the coffee to be overextracted in your tests, or was is more of a theoretical concern? I noticed in CNET’s review of OXO’s 12-cup big sister model, they found the amount of dissolved solids in the coffee to be higher than the optimal target – another sign of over extraction? Anyway, I think I’m going to return this machine. The longer brewing time is annoying, and more importantly, the bitter coffee is far from satisfying. I think the two problems are related.